Rediscover the legend of Excalibur, King Arthur, and the Knights of the Round Table in this Scribner Classics keepsake edition of Sir Thomas Malory’s enchanting Arthurian legend. 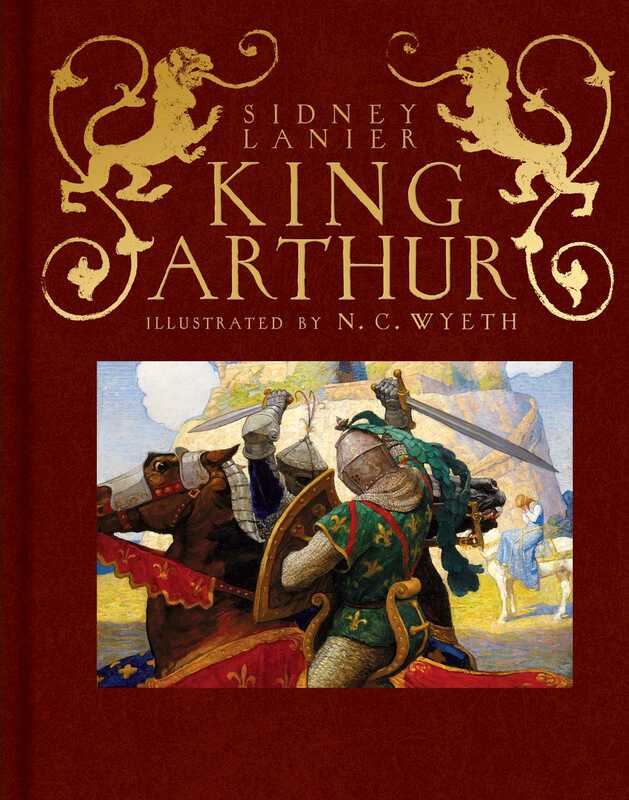 This collectible edition of King Arthur features text reset in the original typeface and illustrations newly reproduced from N. C. Wyeth’s original canvases, bringing a beloved classic tale to a whole new generation of readers. It befell in the days of the noble Utherpendragon, when he was King of England, [that there was born to him a son who in after time was King Arthur. Howbeit the boy knew not he was the king’s son. For when he was but a babe] the king commanded two knights and two ladies to take the child bound in rich cloth of gold, “and deliver him to what poor man you meet at the postern gate of the castle.” So the child was delivered unto Merlin, and so he bare it forth unto Sir Ector, and made an holy man to christen him, and named him Arthur; and so Sir Ector’s wife nourished him. Then within two years King Uther fell sick of a great malady; [and thereof he died]. Then stood the realm in great [danger] a long while, for every lord made him strong, and many weened [thought] to have been king. [And so, by Merlin’s counsel, all the lords of England came together in the greatest church of London on Christmas morn before it was day, to see if God would not show by some miracle who should be king.] And when the first mass was done there was seen in the church-yard, against the high altar, a great stone four-square, like to a marble stone, and in the midst thereof was an anvil of steel, a foot of height, and therein stuck a fair sword naked by the point, and letters of gold were written about the sword that said thus: WHO SO PULLETH OUT THIS SWORD OF THIS STONE AND ANVIL, IS RIGHTWISE KING BORN OF ENGLAND. So when all the masses were done, all the [lords] went for to behold the stone and the sword. And when they saw the scripture, some assayed [tried] such as would have been king. But none might stir the sword nor move it. And upon New Year’s day the barons let make a tournament for to keep the lords together, for the archbishop trusted that God would make him known that should win the sword. So upon New Year’s day when the service was done the barons rode to the field. And so it happened that Sir Ector rode to the jousts, and with him rode Sir Kay, his son, and young Arthur that was his nourished brother. [But Sir] Kay had lost his sword, for he had left it at his father’s lodging, and so he prayed young Arthur to ride for his sword. “I will with a good will,” said Arthur, and rode fast after the sword; and when he came home, the lady and all were gone out to see the jousting. Then was Arthur wroth, and said to himself, “I will ride to the church-yard and take the sword with me that sticketh in the stone, for my brother Sir Kay shall not be without a sword this day.” And so when he came to the church-yard Arthur alighted, and tied his horse to the stile, and so went to the tent, and found no knights there, for they were all at the jousting; and so he handled the sword by the handles, and lightly and fiercely he pulled it out of the stone, and took his horse and rode his way till he came to his brother Sir Kay, and delivered him the sword. And as soon as Sir Kay saw the sword, he wist [knew] well that it was the sword of the stone, and so he rode to his father, Sir Ector, and said: “Sir, lo here is the sword of the stone; wherefore I must be king of this land.” When Sir Ector beheld the sword, he returned again and came to the church, and there they alighted, all three, and went into the church, and anon he made Sir Kay to swear upon a book how he came to that sword. “How gate [got] you this sword?” said Sir Ector to Arthur. “Found ye any knights about this sword?” said Sir Ector. “That is no mastery,” said Arthur; and so he put it in the stone. Therewith Sir Ector assayed to pull out the sword, and failed. “Now assay,” said Sir Ector to Sir Kay. And anon he pulled at the sword with all his might but it would not be. “Now shall ye assay,” said Sir Ector to Arthur. “I will well,” said Arthur, and pulled it out easily. And therewithal Sir Ector kneeled down to the earth, and Sir Kay. “Nay, nay, my lord Arthur, it is not so: I was never your father nor of your blood, but I wote [know] well ye are of an higher blood than I weened [thought] ye were.” And then Sir Ector told him all. Then Arthur made great moan when he understood that Sir Ector was not his father. Therewithal they went unto the archbishop, and told him how the sword was achieved, and by whom. And upon the twelfth day all the barons came thither for to assay to take the sword. But there afore them all, there might none take it out but only Arthur; wherefore there were many great lords wroth, and said, “It was great shame unto them all and the realm to be governed with a boy of no high blood born.” And so they fell out at that time, that it was put off till Candlemas, and then all the barons should meet there again. But always the ten knights were ordained for to watch the sword both day and night; and so they set a pavilion over the stone and the sword, and five always watched. And at Candlemas many more great lords came thither for to have won the sword, but none of them might prevail. And right as Arthur did at Christmas he did at Candlemas, and pulled out the sword easily, whereof the barons were sore aggrieved, and put it in delay till the high feast of Easter. And as Arthur sped afore, so did he at Easter; and yet there were some of the great lords had indignation that Arthur should be their king, and put it off in delay till the feast of Pentecost. And at the feast of Pentecost all manner of men assayed to pull at the sword that would assay, and none might prevail; but Arthur pulled it out afore all the lords and commons that were there, wherefore all the commons cried at once: “We will have Arthur unto our king; we will put him no more in delay; for we all see that it is God’s will that he shall be our king, and who that holdeth against it we will slay him.” And therewithal they kneeled down all at once, both rich and poor, and cried Arthur mercy, because they had delayed him so long. And Arthur forgave it them, and took the sword between both his hands, and offered it upon the altar where the archbishop was, and so was he made knight of 1 the best man that was there. And so anon was the coronation made, and there was he sworn to the lords and commons for to be a true king, to stand with true justice from thenceforth all the days of this life. Also then he made all lords that held of the crown to come in, and to do service as they ought to do. And many complaints were made unto King Arthur of great wrongs that were done since the death of King Uther, of many lands that were bereaved of lords, knights, ladies and gentlemen. “Wherefore King Arthur made the lands to be given again unto them that owned them. When this was done that the king had stablished all the countries about London, then he let make Sir Kay seneschal of England; and Sir Baudwin of Britain was made constable; and Sir Ulfius was made chamberlain; and Sir Brastias was made warden to wait upon the north from Trent forwards, for it was that time for the most part enemy to the king. Then on a day there came into the court a squire on horseback, leading a knight before him wounded to the death, and told him there was a knight in the forest that had reared up a pavilion by a well [spring] side, “and hath slain my master, a good knight, and his name was Miles; wherefore I beseech you that my master may be buried, and that some good knight may revenge my master’s death.” Then was in the court great noise of the knight’s death, and every man said his advice. Then came Griflet, that was but a squire, and he was but young, of the age of King Arthur, so he besought the king, for all his service that he had done, to give him the order of knighthood. “Well,” said King Arthur. So, at the desire of Griflet, the king made him knight. “What ye will, my lord,” said Sir Griflet. “I will promise you,” said Griflet, “as ye desire.” Then Sir Griflet took his horse in great haste, and dressed his shield, and took a great spear in his hand, and so he rode a great gallop till he came to the fountain, and thereby he saw a rich pavilion, and thereby under a cloth stood a fair horse well saddled and bridled, and on a tree a shield of divers colors, and a great spear. Then Sir Griflet smote upon the shield with the end of his spear, that the shield fell down to the ground. “For I will joust with you,” said Sir Griflet. “That is me loth,” said the knight, “but sith [since] I must needs, I will dress me thereto; but of whence be ye?” said the knight. “Sir, I am of King Arthur’s court.” So they ran together that Sir Griflet’s spear all to-shivered [shivered all to pieces], and therewithal he smote Sir Griflet through the shield and the left side, and brake the spear, that the truncheon stuck in his body, that horse and knight fell down. When the knight saw him lie so on the ground he alighted, and was passing heavy, for he wend [weened] he had slain him, and then he unlaced his helm and got him wind, and so with the truncheon he set him on his horse, and betook him to God, and said he had a mighty heart, and if he might live he would prove a passing good knight. And so Sir Griflet rode to the court, whereas great moan was made for him. But through good leeches [surgeons] he was healed and his life saved. So, as they went thus talking, they came to the fountain, and the rich pavilion by it. Then King Arthur was ware where a knight sat all armed in a chair. “Sir knight,” said King Arthur, “for what cause abidest thou here? That there may no knight ride this way but if he do joust with thee?” said the king. “I rede [advise] thee leave that custom,” said King Arthur. “I will amend it,” said King Arthur. “As for death,” said King Arthur, “welcome be it when it cometh, but as to yield me to thee as recreant, I had liever die than to be so shamed.” And there withal the king leapt unto Pellinore, and took him by the middle, and threw him down, and raced5 off his helm. When the knight felt that, he was adread, for he was a passing big man of might, and anon he brought King Arthur under him, and raced off his helm, and would have smitten off his head. “Why, who is he?” said the knight. “No force,” 8 said Merlin, “hereby is a sword that shall be yours, and [if] I may.” So they rode till they came to a lake, which was a fair water and a broad, and in the middest of the lake King Arthur was ware of an arm clothed in white samite, that held a fair sword in the hand. “Lo,” said Merlin, “yonder is that sword that I spake of.” With that they saw a damsel going upon the lake. “What damsel is that?” said Arthur. “That is the Lady of the Lake,” said Merlin; “and this damsel will come to you anon, and then speak ye fair to her that she will give you that sword.” Anon withal came the damsel unto Arthur and saluted him, and he her again. Then King Arthur looked upon the sword and liked it passing well. “Me liketh better the sword,” said King Arthur. So they rode on to Caerleon, and by the way they met with Sir Pellinore. But Merlin had done such a craft that Pellinore saw not Arthur, and so he passed by without any words. So they came unto Caerleon, whereof the knights were passing glad; and when they heard of his adventures, they marvelled that he would jeopard his person so alone. But all men of worship said it was merry to be under such a chieftain that would put his person in adventure as other poor knights did. And Merlin went forth to King Leodegrance of Cameliard, and told him of the desire of the king, that he would have to his wife Guenever his daughter. And so King Leodegrance delivered his daughter Guenever unto Merlin, and the Table Round with the hundred knights; and so they rode freshly with great royalty, what by water and what by land, till they came that night unto London. Then in all haste the king did ordain for the marriage and the coronation in the most honorablest wise that could be devised. Within short time Merlin had found such knights that should fulfil twenty and eight knights, but no more he could find. Then the bishop of Canterbury was fetched, and he blessed the sieges [seats] with great royalty and devotion, and there set the eight and twenty knights in their sieges. And so they arose and did their homage. And when they were gone Merlin found in every siege letters of gold that told the knights’ names that had sitten therein. But two sieges were void.